This article we would like to start a series of articles about the most interesting and famous IKEA. And we start with perhaps chair Poeng. This unusual chair "born" in the bowels of IKEA in the distant 1975 year. Since then, one of the chairs turned the whole series Poeng which, apart from the very first model, includes a swivel chair, rocking chair, chair, bench and stool for your feet. At the moment, these chairs are sold in IKEA stores worldwide. What is so unusual and compelling found buyers in this chair? For more than a year 1975 innovative design based on the latest, at the time technologies. Curved frame chair of the multi-layer laminated wood without hind legs support the weight of carrying up to one hundred and seventy pounds, that looks awesome. Due to this construction, seat Poeng allows you to feel like in a rocking chair. It's a little springy under the weight of a person that helps you relax and forget about all the difficulties and experiences. The design of the chair may seem flimsy, but only at first glance. At IKEA stores, there are stands that mimic the use of the chair man of average build. 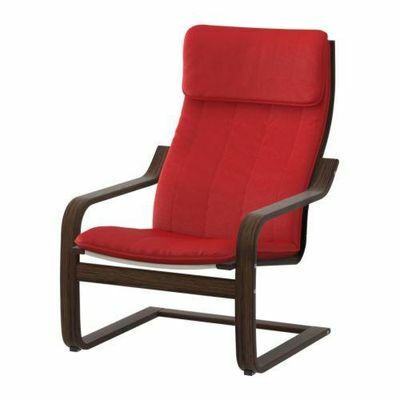 The assurances of the company, this chair can withstand more than a hundred thousand uses. A huge number of colors of the frame and seat upholstery options allow you to choose the option that will best look in your interior. Different quality upholstery Poeng series - from the usual furniture fabric to noble skin. Do you want to relax after a hard day's work - pay attention to the footstool of the same series or even a chair couch. His frame is also made of multilayer Curved wood and design features allow to take half upright position. Want to pick up a chair for work, but are tired of the standard solutions available on the market, be sure to look at the rotating chair Poeng. It is not only unusual, but also convenient, its anatomical back will make you feel more than comfortable. All the above advantages of this series must also include and removable seat-covers. IKEA often uses this technique to with minimum investment can be quickly and painlessly for most of the budget to change your interior or the color palette. In addition, it facilitates washing upholstery and operation of the chair. In conclusion, we invite you to learn more about and see reviews chair Poeng in our catalog.